Israel’s Netanyahu government isn’t just focussed on the oppression of Palestinians. Tim Robertson reports on the ongoing treatment of African refugees. “I’ve given instructions to advance legislation of a new law that will enable holding illegal labour infiltrators in custody… We must continue the steps that have totally blocked the infiltration to Israel so far…Illegal infiltrators have no special privileges at the expense of Israel’s citizens. The ‘infiltrators’ are mostly Sudanese and Eritreans trying to escape the violence and persecution in their homelands. The Israeli government is amending an old Anti-Infiltration Law, which was first enacted in 1954 to keep Palestinian refugees and Fedayeen fighters out, in an attempt to give it the necessary legislative cover to evict genuine refugees. Originally the law gave the government the power to expel those it considered a security risk. Like much of the anti-terror legislation in the West today, it used the threat of terrorism and the need to ensure national security as a pretext for striping away basic rights and contravening the rule of law. Political leaders are, today, framing the ‘threat’ posed by the African asylum seekers slightly differently. ‘Bibi’ has repeatedly made it clear that the African migrants’ race and faith – or lack there of – is central to his government’s efforts to expel them. Speaking in 2012, he warned that “if we don’t stop their entry, the problem that currently stands at 60,000 could grow to 600,000, and that threatens our existence as a Jewish and democratic state”. There’s also been racist fear-mongering about African asylum seekers bringing disease, committing crimes, threatening security and stealing jobs, all of which has been repeatedly shown to be unfounded. The stumbling block for Israel has been international law and the principle of non-refoulement, which makes it illegal to return refugees to their country of origin when their life and freedom might be endangered. Not to be deterred by such things, the Netanyahu government has been increasing the bureaucratic pressure on the asylum seekers in an effort to force them to leave. It accepts claims for asylum only in exceptional circumstances: In the last six years, the acceptance rate has been less than one percent. While the government acknowledges it can’t deport refugees back to Sudan or Eritrea, it only grants them collective temporary protection and continues to refuse them permanent residency and citizenship. This leaves them in limbo, trapped in a country that doesn’t want them, deprives them of many social rights and refuses to grant them any certainty about their future. Hameish Elsheikh is a Sudanese asylum seeker who, fearing he’d be conscripted into the army, fled the civil war in Darfur in 2001. He made his way to Egypt, but was again forced to escape when, on the night of December 29, 2005 Egyptian troops killed 27 Sudanese asylum seekers who were protesting the suspension of UNHCR’s Refugee Status Determination process. Hameish decided in was no longer safe in Egypt, but he had few other options. “I was going to go to Lebanon or Libya, but my passport had expired and I could not renew it because I was registered with the UN as a refugee. So I went to Sinai and paid $120 to a Bedouin to drive me to the [Egypt-Israeli] border,” he said. Once there, he crossed into Israel illegally, somehow managing to escape the gunfire of Egyptian border guards. Hameish has now been living in Israel for over eight years. He speaks Hebrew fluently and has a promising acting career in the theatre, yet the government continues to deny him permanent residency. His future is shrouded in uncertainty and he says he fears what the government might have in store for him. He doesn’t know if he will have his visa renewed next time, he’s not legally permitted to work and he doesn’t know whether he’ll see his family again. Yet he says his situation is, relative to other asylum seekers, not that bad. He is part of the small minority that hasn’t been forced to leave Israel and still lives within the community, albeit with some serious restrictions. The Ministry of Interior has recently amended the Anti-Infiltration Bill to make it lawful to imprison asylum seekers indefinitely in the Holot detention centre, located in the Negev desert, near the border with Egypt. Two previous amendments have been abrogated by the High Court and the most recent changes are currently being challenged. What this means, in effect, is that asylum seekers who have been living in the community for some years on temporary protection visas are suddenly being detained when they go to renew their visa or check-in, as they’re required by law to do, with the Ministry of Interior. In April, the Immigration Authority began distributing letters to asylum seekers in detention informing them that they would be forced to leave Israel within 30 days. The suffering of asylum seekers and the hardships they been forced to endure, not just in their homelands, but also once in Israel, goes unremarked upon by politicians. Instead, they are spoken about as if they are criminals, who interfere in the lives or ordinary Israeli’s and, for that, must be banished. While some claim these letters amounted to little more than a political stunt, what’s undeniable is that the Netanyahu government is doing all it can to rid Israel of African asylum seekers. 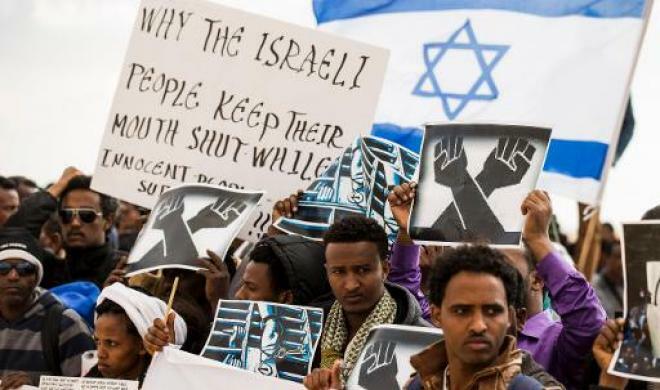 Most of the Eritrean’s who have fled to Israel are escaping their country’s indefinite military conscription. Despite the government’s shoot-to-kill policy towards those trying to flee, Israel refuses to acknowledge this as legitimate grounds for granting asylum. Thus, the Ministry of Interior presents the refugees with a stark choice: either face indefinite imprisonment in Saharonim Prison or agree to be deported to Rwanda (until recently, Israel was also deporting asylum seekers to Uganda, but, according to the Hotline for Refugees and Migrants, an NGO that provides legal support to asylum seekers, that seems to have ceased). Israeli authorities claim that Mikele is one of the 9,026 African asylum seekers who have ‘voluntarily’ left the country over the past two years. It sounds naïve to point out that Israel’s behavior contravenes all kinds of UNHCR guidelines and think that actually means something. Nevertheless, I’ll continue the charade: Israel can’t ensure the protections of the asylum seekers once deported, nor are their claims of asylum ever seriously considered. Moreover, there’s a great deal of secrecy surrounding the whole process. What can be gleaned from various media sources and the work of NGOs is that the asylum seekers, once ‘resettled’, face a whole new host of challenges. Various reports have found that asylum seekers have been imprisoned, some have had their travel documents confiscated and commonly they’re forced to pay bribes, rendering them penniless and without shelter, legal status or anywhere to go. This creates a situation often referred to as ‘refugees in orbit’, in which those seeking protection are not deported directly to their State of origin, but are sent to a third State were they’re not safe and forced to continue seeking asylum elsewhere. The agreements between Israel and the receiving countries have remained largely secret; however, in a deal that bears all the hallmarks of the slave trade, part of the deal involves the sale or trading of Israeli arms. Unsurprisingly, Israel has shown little interest in whose hands its guns end up in: one shouldn’t forget that Israeli arms were used to commit genocide in Rwanda and Serbia. The government even approved weapons transfers to Slobodan Miloševic while ethnic cleansing was in progress. That’s a sobering thought. Not only do Israel’s leaders implement xenophobic policies towards African asylum seekers that cause a great deal of human suffering, they also bribe other poorer nations with arms that will likely be used to inflict more misery and death.